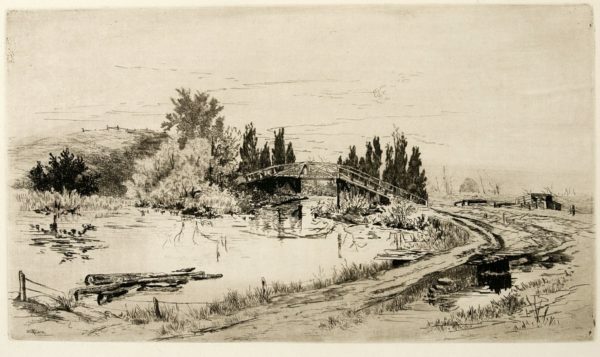 Otto Bacher, Fondamenta dei Tolentini, 1880. An important gift to the Syracuse University permanent art collection came in 2017 from Rona and Martin Schneider of Brooklyn, New York. Rona, a well-known print dealer and member of the International Fine Print Dealers Association, specialized in late 19th and early 20th century American and European prints especially those made as part of the “Etching Revival.” In recognition of this substantial gift, we are displaying a small number of works by American and European artists from the Schneider Collection that are fairly representative of the larger Schneider Collection. 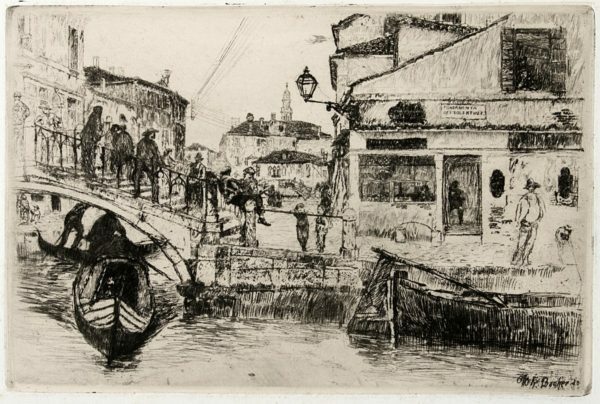 This exhibition highlights some of the important pieces in the collection including work by members of the New York Etching club that was founded in 1877. 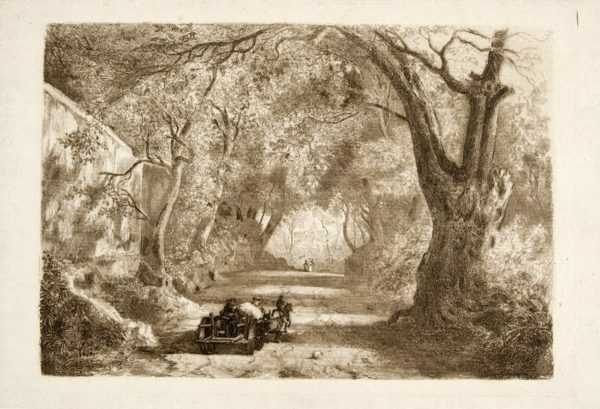 At their first meeting, Robert Swain Gifford made an etching that was printed by Leroy Milton Yale. An impression from that plate is in the exhibition. Over the next 20 years, members of the club produced thousands of prints, many of which were displayed in exhibitions held in New York City at the National Academy of Design, in Chicago at the World’s Fairs and the Art Institute, and in Europe at different venues. The Etching Club helped to drive interest in the United States over the next few decades and other cities, including Philadelphia, Boston, Cincinnati, and Chicago. By the end of 1932, print clubs and art societies could be found across the country. In Europe and America both, print organizations led to annual exhibitions of printed art and books that included original works of art. In 1879, Sylvester Rosa Koehler began the American Art Review and published original prints as part of the magazine. The “Works of the American Etchers” became a feature of the magazine and a large number of the prints in this exhibition came from that publication.